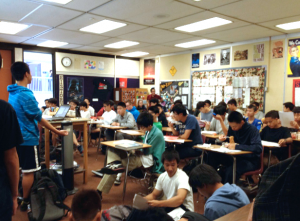 “I started a go club in my school this year, and more than 100 people signed up in the first week,” reports Yunxuan Li 6d, a sophomore at Diamond Bar High, a suburb in the LA metro area. Li, who has won the Young Lions Tournament for the past two years in a row, is well known on the AGA circuit, having also been a Redmond Cup finalist, and representing the US at the 2013 Samsung World Baduk Masters Championship. “In the game of go, there are no formulas or equations,” says Li, “it is all about creating your own tactics and solutions to everything. In a way, it is very similar to life. I was very happy to see my club be successful because it showed that people appreciate and are interested in this wonderful game. We have had five meetings so far, with 30-50 people showing up and participating actively. I have taught everyone the basic steps slowly and they all seem to understand the process very well.” Li has a few tips for youth who want to start a club at their school. “First, I think it is necessary to make an attractive poster, it will give people a reason to join your club. * Second, I think it is necessary to make good flyers and handouts that introduce the game. These make people think your club is organized and give them detailed ideas about what will happen. Third, don’t take out the go boards and play on the first meeting. The first meeting is better if it is a lot of fun and gives people a reason to stay in your club. Fourth, it is a good idea to use a large demonstration board when teaching; it makes people understand the concepts so much easier than going around with a small board. 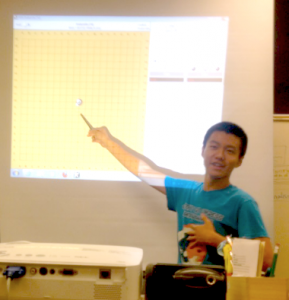 If you don’t have a demonstration board, you can use KGS with a projector. Fifth, hold some tournaments, so members develop a competitive mindset” *Editor’s note: Posters, playing sets, and everything you need to launch a school club, are all included in the AGF Classroom Starter Set, which is free for any US school that wants to launch a go program. Details on the AGF website here. -Paul Barchilon, E-J Youth Editor. Photos by Yunxuan Li: Upper left: Yunxuan Li 6d talks about tengen; Lower right: More students than chairs, at a recent meeting.